​The Commissionee had recently lost her little Boxer girl Holly, and wanted a keepsake of her. I was sent a collection of photographs of her but this one was the one chosen for the portrait as it was the perfect pose for a portrait. I was also sent an outdoor image of Holly too to ensure the correct colouration could be adapted in to the final portrait. The reference photograph used for the portrait had been taken indoors and so the lighting on the image was unbalanced, so working from other images of Holly that I had been supplied with, I was able to balance out both sides of the face and create that shine in Holly's eyes that give her such a soulful expression. 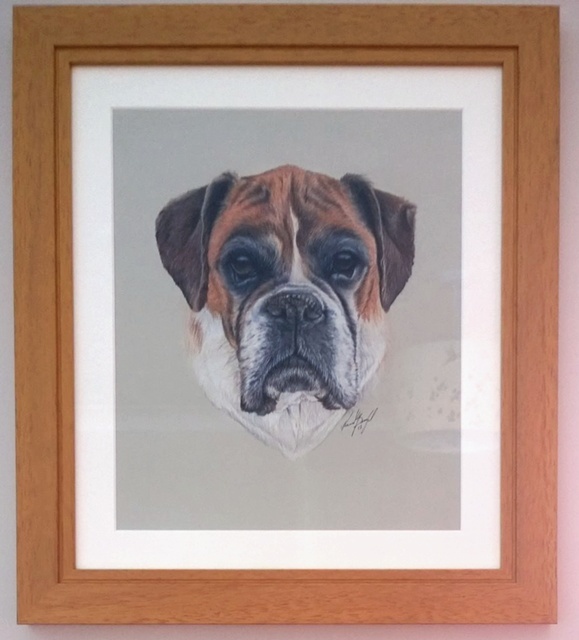 For the fine detail that could not be seen on the mobile phone image, I used a collection of other Boxer dog images that I have in my own reference library to ensure the final portrait had as much definition as possible.